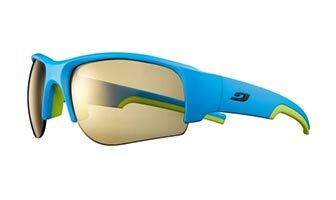 JULBO Dust is designed for mountain biking and outdoor racing enthusiasts. No adjustment necessary with an instant snug fit! Perfect and imperceptible hold on the face with Grip Nose and Grip Tech temples. The slim and flexible frame can be slipped comfortably under a hat or helmet. The wide field of vision is combined with excellent venting thanks to the technical size of the suspended lenses.